I have recently started working as an editor at Shermans Travel and when I was assigned an article on serene parks in chaotic cities, my mind went back to the last year and the calm I felt in Cairo’s Al-Azhar park while trying to adapt to the overwhelming city. With the news that is coming out of Egypt over the past week or so, no-one is promoting Egypt travel and so I cut the Cairo section. But I am still thinking about Al-Azhar and hoping for Egypt. With more than its fair share of traffic, overpopulation and pollution, Cairo can be an overwhelming and exhausting place to visit. The city has a shortage of open spaces so when Al-Azhar opened in 2005 it must have come as a huge relief for the city’s inhabitants and visitors. The site of this 74-acre park was, incredibly, once a garbage dump. Its transformation was funded by His Highness Aga Khan IV who, after seeing piles of garbage from his hotel balcony, decided to intervene and offer the new park as a gift to the people of Cairo. 80,000 truckloads of garbage were removed from the site in the process. 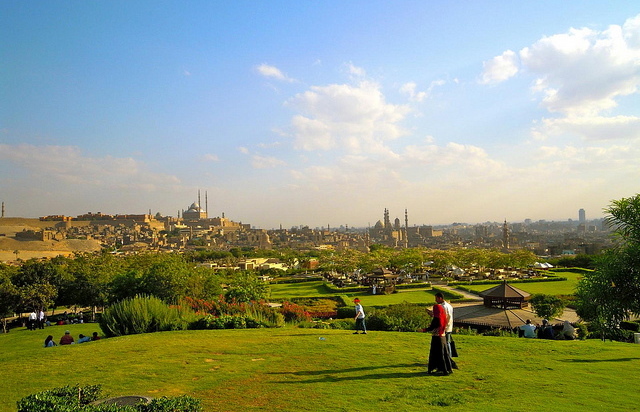 The park is beautifully landscaped, featuring lawn areas, fountains, courtyards, restaurants, cafes, excellent views of the Citadel — especially scenic at sunset — and green, green grass, the likes of which you will struggle to find elsewhere in Cairo. A long stretch of the historic Ayyubid city wall was discovered during excavation and runs along the western end of the park.